Thread Bits – & Newsy Bits, Too. This is my Orts Jar. I’ve written about it before. The significant fact here is that this is my Orts Jar, a couple days before beginning the Secret Garden project. The thread bits (orts are leftover little bits of thread) are packed in there. Packed, I tell you! But you see that there is still quite a bit of space in the pint-sized jar, so I continue packing ’em in while I’m working on the Secret Garden project. I’m showing you this now, just in case The Jar reveals Something Interesting at the end of the Secret Garden project. Methinks it will. Other stitchers are beginning to add some photos to the Secret Garden Embroidery Group on Flickr. If you want to join in and add some pictures of your own project progress, we’d love to see them! Remember the woolies we chatted about yesterday? Well, if you’d like to read more about them – and even see some on display – start with this article, “The Wonderful World of Woolies,” from Southern Maryland Newspapers Online. There, you’ll learn about a collector of woolies, and you’ll read about the exhibit of Woolies at Annmarie Sculpture Garden & Arts Center in Dowell, Maryland. 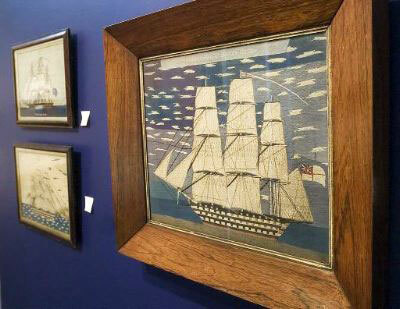 The exhibit is titled “Sailor Made: Return of the woolies,” and it runs from May 23 of this year, through January 25, 2015. Especially if you live in the Northeast, it would be worth a little summer road trip to see this wooly bit of history! Last week, I mentioned Hedgehog Handwork’s 15% off for 15 days sale – you still have a week to take advantage of that! The response to the mention of the sale was apparently pretty enthusiastic. They’re trying to avoid backorders, so that everything you order can be shipped at once. To that end, they’re receiving more goods from suppliers this week, and she asked if I could assure my readers who have placed orders in the last week that your orders will be coming soon. And I’m sure they will! The Hedgehogs are very good about that. I never actually know the effect of a mention on Needle ‘n Thread (very few people tell me the details – whether it’s a book review, thread talk, kit or product review, sale mention, or whatever) – so I thought this was kind of funny. But at the same time, I feel really bad for the Swamped Hedgehogs. Whoops! Remember this Stitch Sampler Alphabet I was working on last summer? The alphabet was the result of a stitching goal: to use 25 – 30 different stitches and stitch combinations to work up a “sampler” alphabet of individual decorative letters that could be used for monogramming and the like. Well, I’ve moved the related e-book to the top of my priority list, so, for those of you who have been asking (thanks heaps for your enthusiasm and patience! ), that is back under way again, and, if all goes as planned, the e-book will be available later this summer. I’ll keep you posted! Don’t forget that the Monograms book give-away is going on right now. It ends this week, so if you haven’t joined in on that, don’t miss your chance to win a copy of this hard-to-find book. A few other delectable things coming up this week as well, including a tiny foray into some whitework-related stitchery, some thread talk, and a little more on the Secret Garden. Hope your week is going well – see you on the morrow! 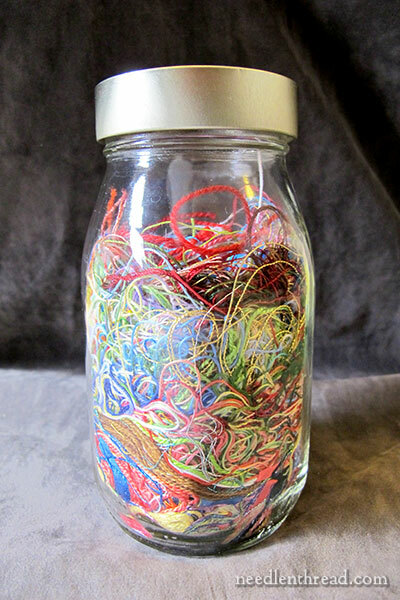 My ort jar is overfilling I need a larger jar I think, it’s amazing all the different coloured thread it looks so rainbowry. I’ve ordered lots of stuff from Hedgehog so I can’t wait to receive the goods it was great to browse through and order supplies from them. I have browsed lots of woolies embroidered ships and they are really lovely so interesting. 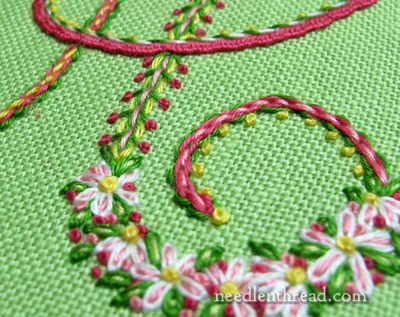 I can’t wait for the e-book stitch sampler alphabet I’m sure I won’t be disappointed hurry Mary! Oh I do hope I win the monogram “sigh”! I’m looking forward to the other delectable things on Needle n’ Thread thanks for the info see you tomorrow. I had ambitions to use my orts, saving them being one of the dozens of things I’ve learned here at needle n thread. My first thought was to bundle them together and couch them down in curves, lines and circles on a free form and/or abstract embroidery. I would love to report that my first attempt succeeded brilliantly, but alas it did not. I haven’t given up yet though. I still think they could be used in some great way. About the Mary Corbet effect – I know that when I tried to order the Secret Garden book from Amazon after you started your project, they were backordered and it took several weeks for me to get my copy. I was sure it was because lots of your readers ordered a copy also!! I used to scatter these Orts in the yard for the bird nests, but then began to wonder if perhaps it made the nests more visible and therefore more vulnerable to predators. I just did a search and multiple sites recommended the following with no mention of increased predation. As other dangers were mentioned and thread leaving was encouraged, I think you are ok.
A. No nylon, plastic or fishing line. C. No pesticides or other loose chemicals on the threads. D. Place threads on bushes or plants near a feeder and don’t tie them down. E. Birds also like human and pet hair that has been matted into small clumps. I know some nest recorders say they occasionally find young birds with their feet ( and even tongue on one occasion) tangled in bits of string and such like. Maybe if you could cut it really short, about 1″, they could use it for a soft lining? As Anastasia says, pet hair is great! Lovely that folk are looking out for wildlife! I heard at one time that cutting the orts into smaller pieces and scattering them outside. The birds pick them up and use them in their nests. Has anyone ever done that? I’ve been putting mine in our compost, but it always feels wasteful for some reason. My orts jar is quite small. I found a pretty glass votive candle holder that I pack with tails. I found one for my husband but I’m jealous. His is cuter. 🙂 When stuffed to the top, it’s quite pretty, especially if I’ve been using metallic threads as well. The sampler alphabet is so pretty. If the option is on the page, I’d like to pin it on Pinterest. Each letter is pretty and it’s a great learning tool. Thanks for the wide (oops, I typed wild LOL) variety of ideas you share here. Thinking of the blackwork fish and that colorful rooster bird, it does get a bit wild after all. One thing you might do with orts is make little tassles with them. The combination of woolies and “The Mary Corbet Effect” made me think of an embroidery in the woolie style with your head blowing a mighty wind to fill the sails of a ship, full of eager shoppers, heading towards the shore where happy hedgehogs await with armloads of threads. Anyway, I’m happy because I just got back from a thread buying spree! I’ll be spending all afternoon winding bobbins. Wow! You have an effect named after you! That’s wonderful!! You should be so excited to have such an effect on a embroidery shop 1/2 a world away. Whether you realize it or not, you are a bit of celebrity in the embroidery world. Just think of the effect if embroidery and sewing could get advertised on Ellen or The View. I am looking forward to your e-book. We are just so grateful for your sharing of these shops and ideas. Really looking forward to the release of your ebook for the embroidered monograms Mary. This is the kind of work I’d like to have with me when I travel. I’m thinking of individual bags made up with supplies required for each letter……another great tip I’ve learnt from your blog! thank you . What wonders again, I loved the “woolies” I do not know, except cannevas. Yes, a thousand times yes, your e-book, I can finally get together with your guidance, I can not wait. For orts, I accumulated for the realization of a huge ball, I expect the same will add lead to more stability. Any ideas why?. Because small needles doors, I do not find them very practical, my referral tangle. There are bits of thread that stay put in a jar??? The only ones I’ve ever come across stick firmly (but cunningly hidden) to my person, only to drop off on the only little bit of cartpet that we have in the whole house. Though I do love shire horses, we do not have one – even a small one – let alone keep it in the house. I meant to type carpet. I forgot all about the alphabet ebook. I’m glad you mentioned it. I’m supposed to be monogramming linens for a recently married friend, but I think I’ll wait for your book. That’s good because I’ve recently become obsessed with spinning yarn and don’t have much time for embroidery. The exhibit of Willie’s is well worth a visit! We often spend weekends on Solomon’s Island, and I dragged my reluctant husband to the exhibit the last time we were there. We both loved it: I for the embroidery (of course) and he for the military history represented. How delightful that you should mention something so local (well, for me!) In your column! Oops: auto spell! That should be Wollies! Hi Mary! Are you planning a contest/give-away for your orts? If so, count me in! Most of my embroidery & lacemaking orts are now earmarked for a fiber artist friend who makes art quilts & other wondrous stuff with them. But back in the day, I took a class from Martha Green (Carney Roadside Attraction School of Crazy Quilting) & we made “wad dolls” using a plastic sandwich bag filled with orts. Years later, a friend & I updated the concept & the dolls morphed into “Little Ortan Annie”. LOA has become an easy & colorful way to repurpose orts for ornaments, gift tags & “just because”. I’m not unsurprised about the M C effect, especially when you take note of the sheer numbers that enter your giveaways. If even a portion of those numbers visit Hedgehog and order they are sure to be swamped! Must mention that I’m really looking forward to the ‘something interesting’. Mary, I love your orts jar and you have inspired me to save mine for my crazy quilt projects etc. I wanted to share this link a friend sent me that shows how human garbage is killing birds. In reading the comments under your older post I noticed many people mentioned tossing the threads for birds and many tried to let them know that is not a good idea. I thought you might want to share the idea that threads can be harmful to birds and kill the hatchlings etc. since many people only read your post and not the comments. Thanks! Previous Previous post: Needle Aweigh!